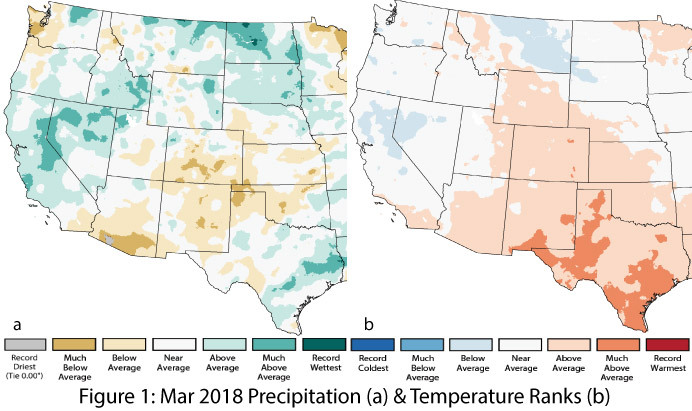 Precipitation and Temperature: Precipitation varied across the Southwest in March, but temperatures remained warm throughout the region. Precipitation amounts ranged from record driest to above average (Fig. 1a). Temperatures ranged from average to above average in Arizona, and from above average to much-above average in New Mexico (Fig. 1b). 2018 year-to-date (Jan-Mar) precipitation ranged from near average to much-below average (Fig. 2a), while temperatures for the same period were above average to much-above average (Fig. 2b). 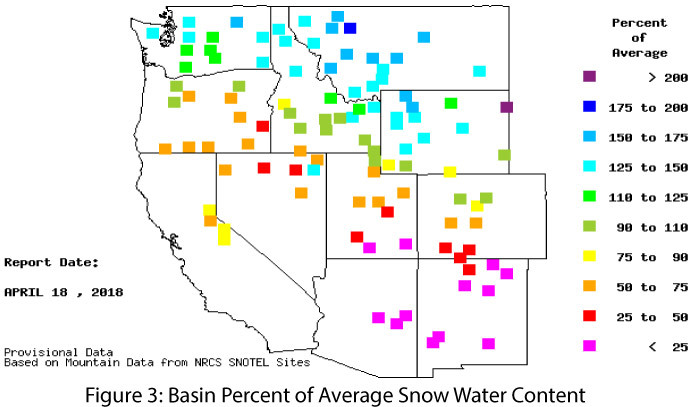 Snowpack and Water Supply: Above-average temperatures and below-average precipitation resulted in snowpack and snow water equivalent (SWE) values that are well-below average across the Southwest (and much of the western United States) (Fig. 3). 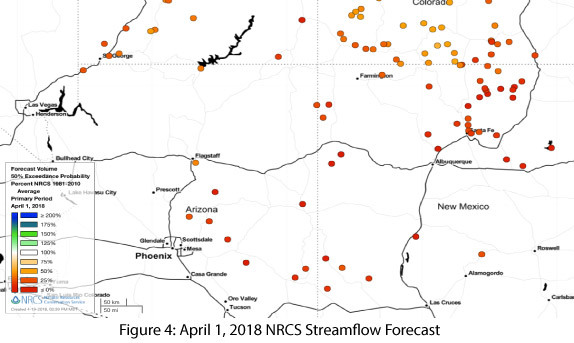 These warm and dry conditions also affected streamflow and runoff timing: streamflow forecasts for Arizona and New Mexico are all well-below normal (Fig. 4). 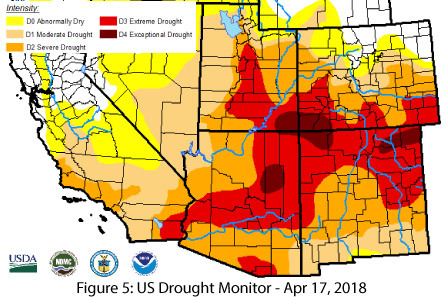 Drought: Drought-designated areas were expanded in the April 17 U.S. Drought Monitor, with Arizona and New Mexico documenting increases in the extent and intensity of drought. Nearly 90​ ​percent of Arizona is class​i​f​ied​ as experiencing severe (D2) or extreme (D3)​ drought​, with a pocket of exceptional drought (D4) in the north​-​central region (Fig. 5). Approximately 70​ ​percent of New Mexico is classified as experiencing severe (D2) or extreme (D3)​ drought​, with a notable increase ​in drought intensity ​​from south to north, where exceptional drought (D4) has emerged. 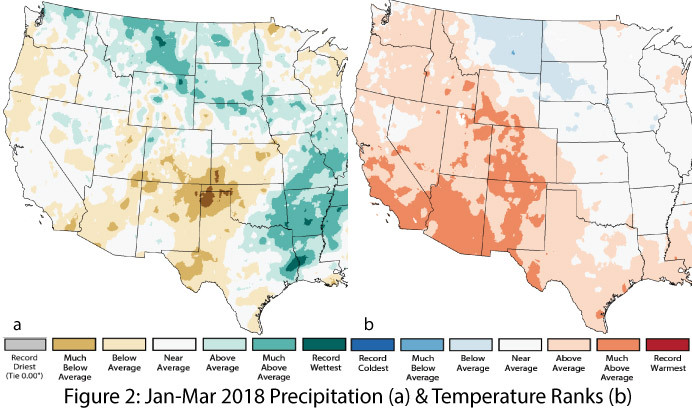 These designations reflect short-term precipitation deficits, above-normal temperatures at monthly and seasonal timescales, and longer-term drought that tracks the cumulative effect of extended periods of warmer- and drier-than-normal conditions. 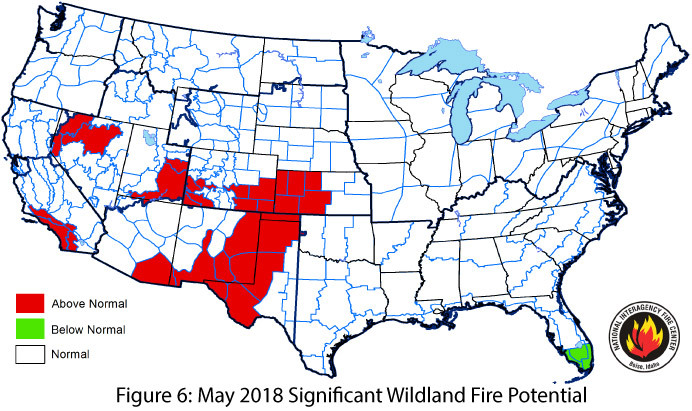 Wildfire: The National Significant Wildland Fire Potential Outlook for May identified above-normal wildland fire risk for eastern New Mexico and the borderlands region in New Mexico and southeastern Arizona, as well as higher-elevation regions in the Upper Colorado River Basin (Fig. 6). The June outlook expands above-normal fire risk to include nearly all of Arizona and New Mexico. Warm and dry conditions this winter, in conjunction with above-normal fine-fuel loading and continuity, are major drivers of the elevated risk, and the Southwest Coordinating Center increased to preparedness level 3 on April 12, reflecting growing concern about fire risk. ENSO & La Niña: Oceanic and atmospheric conditions remain broadly indicative of a weak La Niña event, but are clearly waning, and trends in these anomalies indicate an imminent return to ENSO-neutral conditions. Most forecasts and outlooks are tracking the gradual decay to ENSO-neutral conditions over spring, and some agencies have already declared this La Niña event over (see La Niña tracker for details). Regardless of when this La Niña event officially ends (or ended), the onset of the characteristically warmer and drier spring conditions in the Southwest means the region is unlikely to see much if any additional precipitation before this summer’s monsoon. Looking back over cool-season precipitation (see Cool Season Precipitation Recap for details), the low seasonal total and relatively few number of days with measurable precipitation are certainly consistent with the reduced precipitation we might expect in a La Niña year. 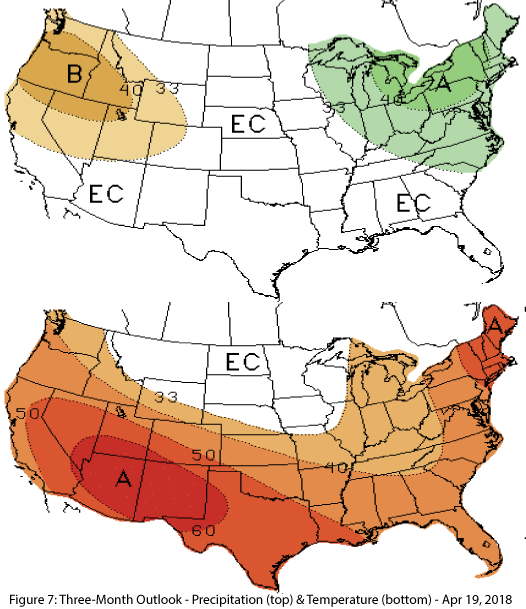 Precipitation and Temperature Forecast: The three-month outlook for April through June calls for equal chances of above- or below-average precipitation in Arizona and New Mexico (Fig. 7, top) and increased chances of above-average temperatures (Fig. 7, bottom) for the entire southwestern United States.